Featuring selected winners from the juried regional. 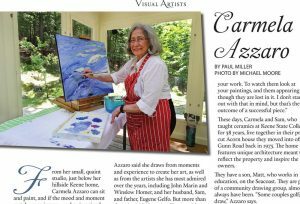 Carmela Azzaro will be exhibiting a collection of acrylic paintings at Murphy Art Gallery in the Colony Mill Marketplace. 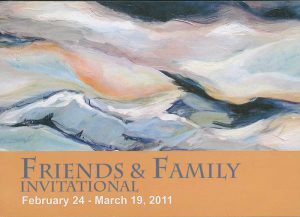 Azzaro’s paintings are based on her observations of water off the coasts of NH, Maine and Hawaii. The foundation for her art and education occurred at Indiana University of Pennsylvania, where she received a BS in Art Education; she taught art in public schools in PA, NY, and NH. She continued her study of painting with John Roberts and Peter Roos, Professors of Art at Keene State College. 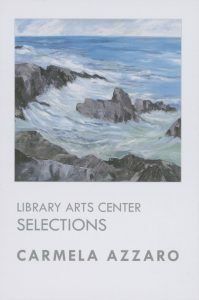 Carmela’s work was included in the Thorne-Sagendorph Art Gallery’s 2007 Biennial Regional Jurors’ Choice Competition; Stonewall Farms 4 Juried Art Auction and The 59 Annual Sharon Members 2007 Exhibition.